This piece was written by the manager of Classy’s data insights team, Dr. Ben Cipollini. In 2016, 3.5 percent of all transactions on Classy occurred on Giving Tuesday alone. That’s 13 times more than a typical day on the platform. Overall, the movement raised $177 million worldwide, a 50 percent increase from the previous year. These incredible Giving Tuesday data spikes speak for themselves: people are participating in the movement, and it warrants your attention. Nonetheless, some organizations are still hesitant to join in on Giving Tuesday. They think their efforts will decrease donations in other campaigns, like year-end fundraising. To address these concerns, we compared the Classy platform’s donation volume on Giving Tuesday to that during year-end giving, specifically around December 31, and disaster relief. We also compared Giving Tuesday donation volume to typical days 4 and 6 weeks earlier, to have comparison points that aren’t affected by the strong day-of-week and monthly trends in fundraising data. Giving Tuesday brings in an incredible number of new donors. New donors acquired through Giving Tuesday are more likely to engage in different campaigns over the next year, than donors acquired via other events. Giving Tuesday donors are 60 percent more likely to give multiple times on that one day compared to donors who give on a typical day or during disaster relief, and 150 percent more likely to give multiple times in one day than on other days during end-of-year fundraising. We began by looking at the fundraising trajectory for the week before and after each event, over multiple years and occurrences , and both across the entire platform and within specific cause categories. This helped us assess consistency, both within an event and across events. Giving Tuesday Data: On the far left, Giving Tuesday shows a single spike drastically above baseline, such that ~25 percent of volume in the month surrounding the event is found on a single day. Year-End Fundraising Data: In the middle, year-end fundraising shows a slow ramp up to a big final day, with a much less focused peak. Other measures (number of donations, site traffic) do not show any spike; instead year-end fundraising brings in larger donations. 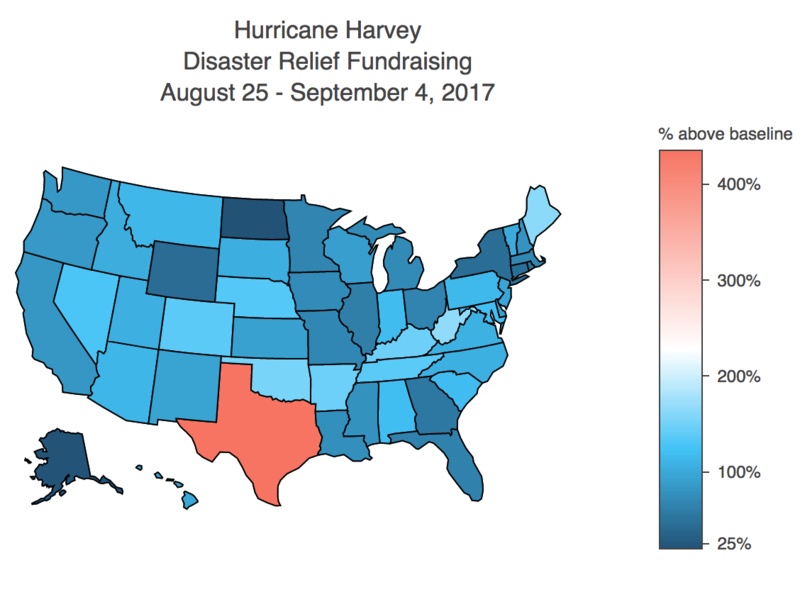 Disaster Relief Data: On the far right, disaster relief shows big changes in fundraising, but much more distributed over time and less consistent with any specific start date. Disaster relief can be very media-driven, and therefore harder to relate to the actual event date. While previous analysis has drawn similarities across these events we actually find very little similarity. The Giving Tuesday data show a clear peak on a single day, end-of-year fundraising shows a slow ramp to a peak on December 31, and disaster relief tends to show extended elevated fundraising over a week following the disaster as media coverage continues to unfold. These Giving Tuesday and end-of-year fundraising trends were also consistent year over year, while disaster relief fundraising was extremely variable both across the platform and within specific categories. Disaster relief is also quite different in that it tends to focus on a specific location and cause category. For example, as you can see in the figure below, Hurricane Harvey focused on Texas and fundraising spiked in the disaster relief cause category, as defined by the National Taxonomy of Exempt Entities (NTEE). In contrast, Giving Tuesday is national with plans to grow internationally, and engages organizations across all cause categories. After reviewing these results, we analyzed recent examples of each event  to better understand how donor behavior drove these various trends. In doing so, we found three core differences between Giving Tuesday and other events that all indicate a prime opportunity for fundraising. Our Giving Tuesday data show that this day is an absolute bonanza of new prospects. It brings in twice as many new donors as December 31, three times more than a typical day during disaster relief, and over 13 times more than a typical day. For each of these events, 75 percent of one-time donations are made by first-time donors—and because Giving Tuesday generates more traffic than any other day, it results in the largest influx of new donors. Typically, strong acquisition channels like peer-to-peer fundraising campaigns can show lower retention rates, purely because the number of new donors is so great. But that’s not the case with Giving Tuesday. Not only is Giving Tuesday the best acquisition opportunity, donors acquired during Giving Tuesday are 10 to 15 percent more likely to give again than donors acquired on typical days through peer-to-peer fundraising campaigns. Though donors acquired on December 31 show higher retention rates year over year than donors acquired on Giving Tuesday, Giving Tuesday donors, are more likely to give again before the next year’s Giving Tuesday event. Donors acquired on December 31 seem to be specifically interested in that single day for tax purposes; they’re harder to activate during other times throughout the year. It’s not just the volume or retention of new donors we find interesting. These donors are also, clearly, much more engaged supporters for the organizations that they give to. We see this in three ways. First, these new donors interact with a more diverse array of campaigns hosted on Classy than donors acquired on December 31, who tend to give through donation pages. Donation pages are excellent for obtaining recurring subscriptions, but compared to ticketed events and peer-to-peer campaigns, they have relatively low donor engagement. Donors acquired on Giving Tuesday are most likely to give on another day to peer-to-peer campaigns, a type of online fundraising that’s highly engaging. This is consistent with the fact that Giving Tuesday is an online event, attracting donors interested in online fundraising opportunities. In addition, we also see that new donors acquired through Giving Tuesday become peer-to-peer fundraisers 3 to 4 times more frequently  than new donors acquired on a typical day or during year-end fundraising. 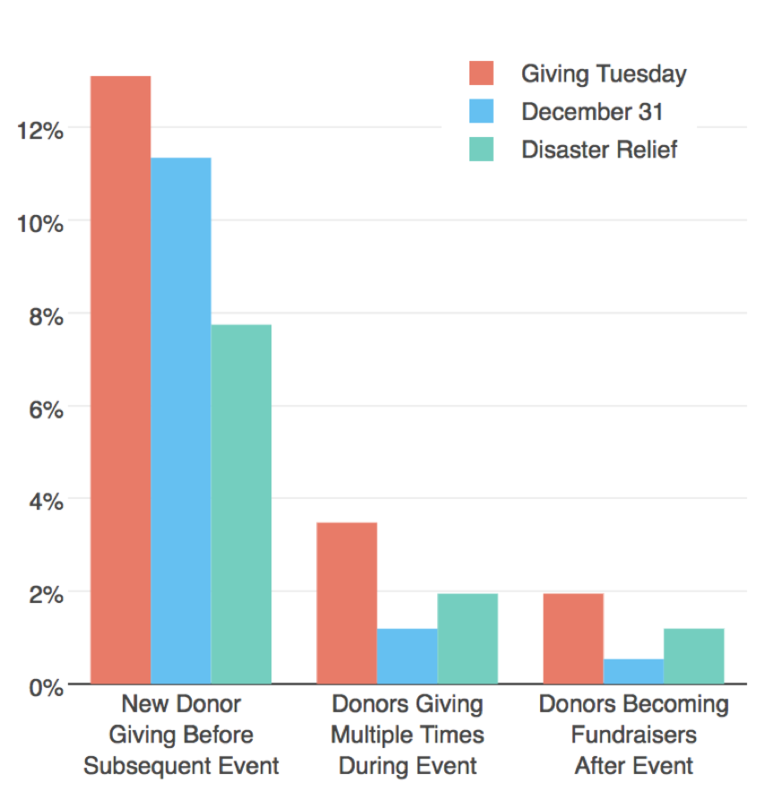 Interestingly enough, disaster relief beat Giving Tuesday, activating new donors to become peer-to-peer fundraisers at twice the rate of Giving Tuesday, and 6 to 8 times more than a typical day and end-of-year fundraising. As a final cherry on top, Giving Tuesday donors are so motivated that they are 60 to 150 percent more likely to give multiple times to the same organization on that single day, compared to donors on a typical day, during end-of-year fundraising, or even during a disaster relief event. Incredibly, we see some donors giving up to 37 times on Giving Tuesday alone. Use crowdfunding and donation page campaigns over ticketed events for Giving Tuesday: Giving Tuesday is an online event and online fundraising campaigns show much more engagement than offline efforts, both in terms of donation volume and gift sizes. Given the short window of giving, focus on crowdfunding and donation pages, and save peer-to-peer fundraising for post-Giving Tuesday to re-engage your new donors. Leverage your social media channels: Giving Tuesday launched as a hashtag and is still driven strongly by social media. New donors are engaged in online fundraising, so use your online tools to engage them. Engage your Giving Tuesday and disaster relief donors to become fundraisers: Donors who are inspired to give for the first time to your organization during these days are already highly activated and much more ready to become peer-to-peer fundraisers. Peer-to-peer fundraisers typically raise 4 to 6 times what the typical donor would give, so this is a great way to advance your online fundraising in leaps and bounds. Given these trends, it’s clear that nonprofits can no longer afford to skip out on Giving Tuesday. This unparalleled opportunity to acquire and engage donors happens once a year, and you can design a campaign that activates your community and jumpstarts your year-end fundraising. Head to our Giving Tuesday website below to get your own tool kit, submit your Classy campaign to be featured, and on the day of, follow the growth of Giving Tuesday with up-to-the-minute stats, leaderboards, and more. If you find these analytics interesting and want to join in, let us know! We’ve published our analyses and data to give some insight into the work we’ve done here and to share some of our tools. We’re also actively participating in DataKind Data Dives in collaboration with 92nd St Y on understanding giving behavior, as well as contributing to other open-source projects. Hit us up or comment below to get involved. Giving Tuesday 2016 (November 29), End-of-year fundraising (December 31, 2016), disaster relief (Hurricane Harvey; August 25-30, 2017), a typical fundraising day (Tuesday, October 18, 2016), and a summary of the platform’s previous 1 year of transactions (Sept 1, 2016 – August 30, 2017). Within 90 days of the given event.